Negative gearing is set for its biggest change in decades. Once considered the sacred cow of federal government policies, both major parties are proposing changes ahead of this year’s federal election. The Labor party has already unveiled its policy, which involves only allowing negative gearing on new houses and cutting the generous 50% capital gains tax concession to 25%. The Government has not confirmed its stance and has attacked Labor policy, but has crucially left its options open. Less than 12 months ago, even considering changes to negative gearing was considered “unpopular” at best with then-Prime Minister Tony Abbott reassuring voters that there would be no changes to negative gearing. Now, while neither the Liberal government or Labor opposition are keen to abolish negative gearing entirely as the Greens and some economists (most notably Saul Eslake) have proposed, both sides of politics are claiming they will “make the system fairer”. So what has prompted this change? 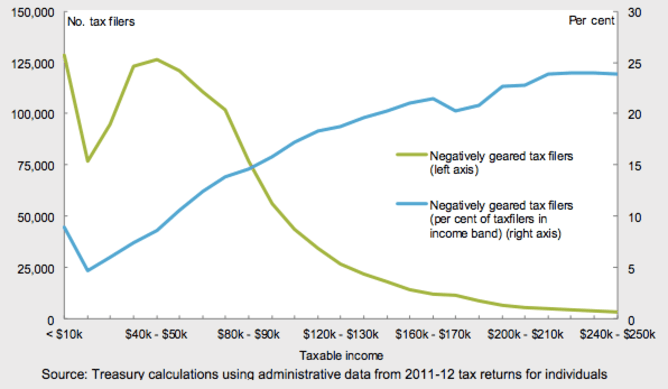 First, a quick refresher on negative gearing. Gearing is the use of debt (such as a mortgage) to increase the amount of money that may be invested. Negative gearing occurs when the cost of this debt (for example, the interest charged) exceeds the income from the investment (like the rent). There is a second benefit from the property investor’s perspective – the treatment of capital gains. When a capital gain on the investment asset is realised (it is sold), the investor gets a 50% discount on the capital gains tax. For many years now, investment properties have been the most popular investment asset after the owner-occupied home and superannuation. Like any other investment, including shares, borrowers may take on debt to facilitate the property purchase. The benefits from negative gearing, combined with the perception of housing as a “safe” asset class with steady capital appreciation has fuelled the flow of investor capital into the market. But now, with growing public awareness of the operation of negative gearing, its cost through missed tax revenue, and increasing housing affordability concerns, even those benefiting from negative gearing are questioning whether it is appropriate. The Coalition government has been reluctant to commit to any policy changes, instead hinting at “capping” the amount of negative gearing benefit that may be claimed. In a way, this is a reinvention of the 2011 Gillard government proposal to target just the “wealthiest” investors who own portfolios of investment properties. We might expect to hear more details from Treasurer Scott Morrison in his Wednesday Press Club address. The Labor party, by contrast, has made the first solid move. In so doing they have made negative gearing a major election issue and will force the government into presenting a real policy proposal, likely as part of the 2016-17 Budget. The Bill Shorten-Chris Bowen policy announced over the weekend has been in the works since April 2015. If implemented, negative gearing would apply as usual to properties purchased prior to July 2017. After this date, however, investors would only be able to claim negative gearing against newly constructed investment properties. The Government’s suggested approach would effectively create a “progressive negative gearing”. The tax rate increases (because the discount decreases) as income increases. While still lacking details, tackling the problem this way more reasonably considers the broad range of individuals who own investment properties, from teachers and nurses to the country’s most wealthy. Labor argues that the asymmetry of its gearing policy between new and existing properties will divert investment to housing construction and boost the housing supply. However, critics of the Labor proposal argue that it will trigger a rush of investors to the existing housing market prior to the July 2017 change, in turn reigniting a house price bubble. To truly benefit from a negative gearing investment strategy, the property buyer would be hoping to win on the capital gains side. For that to occur, property prices need to keep rising, yet that is exactly what the policy is hoping to contain. Savvy investors will know this and take their savvy dollars elsewhere. If you still believe there will be a boom in 12 months time, the better strategy would be buy now (well, technically, when or if Labor are successful at the election) in order to sell to some sucker then. An even more critical flaw in the Labor proposal is the absence of strategy addressing when and where we will see this new housing supply. Fundamentally, either approach makes housing a less attractive investment. In the short term investors will look to move their capital into other asset classes, primarily the stock market, which has been volatile. It could take decades to see the broader implications of removing the incentive to invest in housing over other assets if existing property owners continue to benefit from “grandfathering” the current rules. Therein lies the flaw with arguing this policy change will also help to repair the federal budget (remembering the owner-occupier still makes their capital gains completely tax free). Ultimately, the tide has turned politically on negative gearing. Whichever party sells their proposal best (alongside changes to superannuation and the GST) will be the election winner.